These stainless steel water pumps are suitable for handling clean water not containing abrasive particles, and fluids which are not chemically aggressive to the pump components. 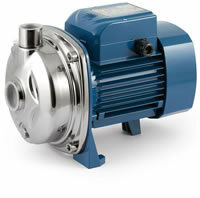 THE HYDRAULIC PERFORMANCE OF THIS STURDY AND COMPACT PUMP MAKES THEM IDEALLY SUITED FOR DOMESTIC, AGRICULTURAL OR INDUSTRIAL USES for clean water not containing abrasive particles, and fluids which are not chemically aggressive to the pump components. Anti-seize, stainless steel pump head suitable for industrial use. Stainless Steel MOTOR BRACKET .